There are times when I’ve gone to a restaurant and had an incredible experience, but for various reasons, I didn’t make it back. Such was the case with Yakuza Lounge on Portland’s northeast side. I had my first experience with my friend DOR last October. It was such an-out-of-control meal we ended up having their burger for dessert. After my rave to w about that dinner, she’s had it on her agenda. Due to extenuating circumstances involving pregnancy, birth, infancy and all the nasty bits that entails, we didn’t have the chance to go until last night, when, thanks to the liberating army of one we call “babysitter Amy”, our date night was locked and loaded, and Yakuza was the target. 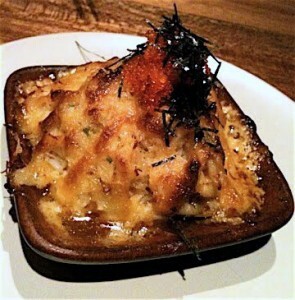 Yakuza is owner Micah Camden’s take on a Japanese izakaya, or drinking bar, where the plates are small and meant to be washed down with copious amounts of beverages. I love walking into the cozy, cool, low-slung dining room, with two and four-tops along the walls and communal tables spread in the middle of the room. The bar and kitchen are in the back corner. The menu has a definite Japanese bent, while not adhering too strictly to Asian tradition. 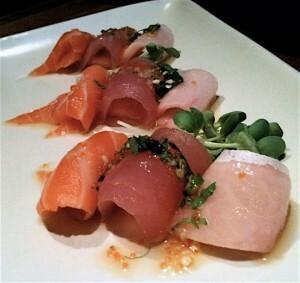 The menu is divided into four sections: salad, signature dishes, signature sashimi, and house rolls. Once again I find myself wanting everything. However, reason in the form of my lovely wife sitting across from me prevailed. We started with a glass of Cava for w and a Ginger Fizz for me, which was a bitey combination of fresh ginger, vodka, lime, simple syrup, and prosecco that would have gone from good to great if it had been served colder. Then the parade of plates commenced, starting with their beautiful Scallop Tempura ($9), a gorgeous and delicious plate of scallop surrounded by a frizz of shredded filo, sitting atop a spicy cream sauce with nori. This is pretty spectacular, a rare dish that tastes as good as it looks. 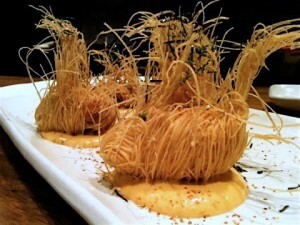 The sauce provides the perfect counterpoint to the crunchy filo and rich scallop encased within. Following that were their Soba Noodles ($7), which were perfect in their simplicity. Cool and soft with bits of ginger to wake up your palate, they were made of a scattering of green onion, a sprinkling of toasted black sesame seeds, bits of nori, and a snappy ponzu sauce lightly dressing the dish. It was really good, and almost palate cleansing in its freshness. Also landing on the table about the same time was the Sashimi Trio ($16), which was comprised of beautifully plated and very fresh tuna, hamachi, salmon with a light Thai chili sauce, and tobiko. Sashimi this good is something I could eat endlessly. Luckily we had other options coming. After that auspicious start, our friendly waiter refreshed our glasses of Cameron Winery “Giovanni” Pinot Bianco ($8 per glass). It was the perfect wine to go with the food in the next round – Dynamite ($10), which is described as Dungeness crab, apple, celery root, and tobiko. We were expecting a salad of some sort. Instead, we got a generously proportioned hot pile of shredded fresh crab mixed with the other ingredients, which we ate with much gusto. The slightly crisped exterior played beautifully with the sweet crab. That is what struck me most about the whole meal at Yakuza. Camden and his kitchen staff seem to have a handle on texture and how important that is to a satisfying meal – soft with crunchy; sweet with tart; hot ginger countered by cool, soft soba. It is really impressive and no mean feat when you sit back and take notice. Our next two plates were perfect edible illustrations of that concept. The Shrimp Roll ($10), is a sushi-house-style roll of tempura shrimp, avocado, and the same spicy sauce that under-laid the scallops, and tobiko. Again with the texture thing: spicy sauce and the crunch of tempura batter around fat, sweet, tender shrimp, and the Yakuza Roll ($9), an eye-opening and palate-pleasing combination of fried, grilled Japanese eggplant and assorted vegetables. The succulent, smoky charred eggplant, all softly cooked, sat astride a crunchy underpinning of cucumbers and carrots, all held together with a nori wrapper and superbly cooked sushi rice. 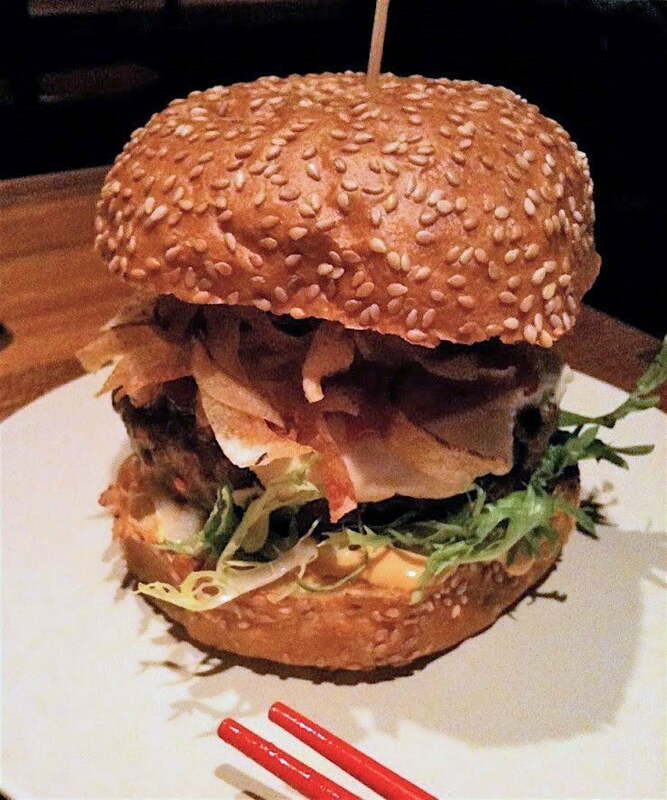 Because of the impression it made on me the first time, I couldn’t leave without the taste of the Yakuza Burger ($12). Once again, this piled-high beauty was satisfying. The grilled, hand-formed patty (I’m not sure where they get it), was very clean tasting, cooked perfectly to medium-rare, and layered with rich chèvre, shoestring potatoes, and a zippy house-made ketchup, all cuddled in between what seemed like a brioche-style sesame bun. This is easily one of the best burgers in town. The surprising thing was that we saw at least two tables who seemed to be having burgers and nothing else with their drinks. How do they do that? Where does that self-control come from? Most importantly, I hope to God it isn’t contagious! As we were getting ready to leave, I mentioned, and w agreed, that this would be a perfect place to take people from out of town for a casual, fun, sure to be satisfying dinner, and to give them what feels like a truly Portland dining experience. Eight months between visits, and just as good as I remember. Kudos to Camden for keeping this part of his mini-empire firmly on course. Rest assured it won’t take me eight more months to get back! Hours: Wed-Sun 5 p.m. – 10 p.m.
Bruce Bauer has been helping fulfill people's need for reasonably priced grape-based beverages at his wine store VINO (previously in the Sellwood neighborhood and now at 137 SE 28th Avenue) for the past 11+ years. He has been involved in all aspects of wine enabling including wholesaling and wine list consulting. He also hosts weekly tastings Friday evenings, Saturdays, and Sundays at VINO. In previous existences he has also co-owned two successful restaurants in Portland. He writes the popular wineguyworld blog, as well as ranting regularly on twitter about all manner of things. 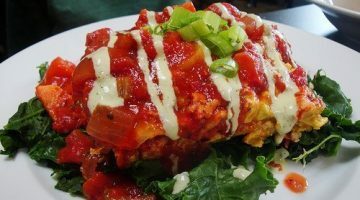 He has traveled extensively around the U.S. and various world destinations looking for new and exciting ways to satisfy his various appetites. He currently lives in SE Portland with his lovely, indulgent, and very understanding wife and his young son C-boy. You can read about his store here. Perfect timing on this review, FD! Plans were made earlier this week to visit tomorrow night. Now I am armed with info and ready to enjoy. Always looking for places I love enough to know I can recommend to others (and myself) and be confident there’s a great experience in store. Will never get past the name. It’s me. …and if you managed that, you’d have to get past Micah’s huge ego. Formidable. I’ll never get past the name either. I’d never go to a place called Russian Mafia, Medellin Cartel, Crips & Bloods, or La Cosa Nostra. Speaking of malapropisms: my favorite is from a dear friend, a well-educated professional, who said “Mazel Tov cocktail” instead of “Malatov”! And she is half-Jewish. Oy! Spellcheck won’t help you if it’s the wrong word! So does anyone know the reason/background/story/justification for the name? This looks like it might be a good review, but I stopped reading when I hit the first “w”. FD, it’s a great idea to have guest writers but surely some sort of editorial style should be imposed on their contributions? And surely you wouldn’t stand for “w” or “DH” in any of them? Not to speak for FoodDude, but I think it’s important to keep in mind that while we all love FD’s contribution to our food-based knowledge and I truly appreciate and am flattered at being given the opportunity to contribute, this isn’t the New York Times. It is a blog, albeit one with a huge amount of credibility and influence. If my use of “w” instead of posting my wife’s name offends your sense of editorial propriety, then perhaps you’re taking the whole thing…and yourself…just a wee bit seriously. First of all, what part of tongue-in-cheek did you not understand? Which by the way, does NOT equate to calling you or anyone a douche. It’s an expression. And also by the way, to the best of my knowledge, the phrase “my wife” or its equivalent in the many languages of the world has served quite well in the history of human communication as a way to refer to one’s wife without actually using her name. Take a breath. Play nice, let it go. For what it’s worth. I do think that saying “douche-chills” is pretty darn close to calling someone a douche. Either way, both expressions are cringe-worthy. Far worse than the original writing offense committed. If only the whole country would have turned around when they saw the letter w, a lot of trouble would have been avoided. But this is misdirected w criticism. I agree with WineGuy. How about WineGal? But then we’d need to see her wine certificate to think her legitimate to carry that title. Nice report that really gives the feel of the place. Not sure if I will go or not, but I do know what to expect if I do. My only complaint is with a few niggling typos . . . did you just get an iPad? Anyone who spends $500 for an iPad just to fine tune their typos needs to rethink their economic priorities. No, I did it with my patented four-fingered typing technique on a $29 external keyboard. Impressive, don’t ya think? Come on, guys. It was a very well written, descriptive review. Lay off. This is a site that doesn’t mandate you pay for, so live with an occasional type-O and sub-NYT attributions. As mentioned above, this is a BLOG, not Wikipedia (yes…sarcasm). Anyways, Bruce: Good review and GREAT photos. Thanks for your efforts. PFA – I don’t think Democratic Underground wants to read your food reviews (hint). They’re not food reviews. Just experiences that happen to mention the food. And they say girls are catty! Everyone’s a critic these days…..try writing a good review. It’s not that easy. Thanks for the heads up. Loved the picture of the scallops. Hey, I resemble that iPad remark. Haha. I only brought it up because I indeed do have an iPad. And it has led to some hilarious (to others) mis-steps in my emails and blogging. Especially BUI (blogging under the influence.) I thought these tools were my friend . . . Sigh. I want an iPad… just so I could be one of the cool kids.